While it is a common tendency to wash any fruit under a briskly running stream of water, there are some people who like to soak them in water for a while. Fruits like apples, mangoes, papayas and pears are generally kept in water for a while in order to wash off any mud or debris. However, there is more to this practice. 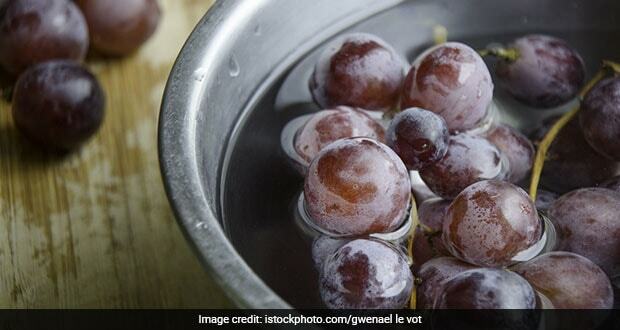 According to Ayurveda expert, Dr. Ashutosh Gautam, “Soaking fruits in water will get rid of heat principle from them. This process is followed so that they do not cause side effects like diarrhoea and skin problems like acne. Moreover, lots of chemicals are used to grow crops nowadays; therefore, it becomes even more important to soak the fruits in water in order to remove any debris or residue left on them.” Read on. Pesticides and insecticides are commonly used on crops in order to prevent bugs and insects from destroying the produce. Pesticides, irrespective of the quantity, are poisonous and can harm more than just the pests at which they are targeted. Exposure to pesticides can pose a number of illnesses, including respiratory tract irritation, allergic sensitisation, headache, eye and skin irritation, and nausea among others. There may be far more serious effects of ingesting pesticides through fruits and vegetables. Therefore, barely washing them off with water wouldn’t really help. It is best to soak them overnight to ensure they are clean enough. It is a common notion that some fruits have thermogenic properties, or in simple terms, they produce heat in the body. The excessive heat may hamper your digestion and cause conditions like diarrhoea and skin problems like breakouts. Fruits like watermelon, mangoes, papayas and pears are often known to produce heat in the body. It is best to soak them in water for a few hours to reduce the taasir, which further doesn’t affect your body. It is a good practice to soak fruits in water as the process may only help clean them thoroughly.